The preeminent ambassador of modern Memphis rap, Young Dolph knows exactly when to pay tribute to his city’s unique hip-hop history. 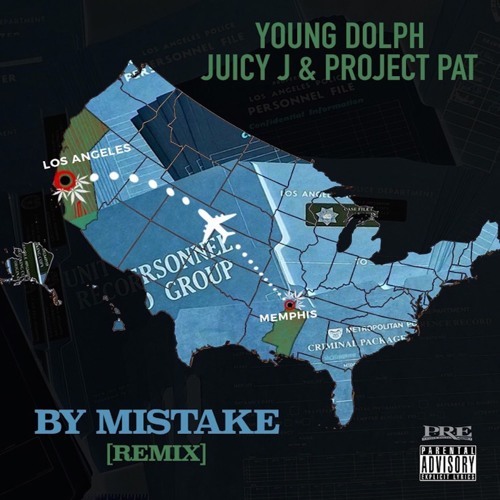 Teaming up with two members of legendary Memphis collective Three 6 Mafia, Dolph recruits Juicy J and Project Pat for “By Mistake” (Remix). With a dramatic minor-key instrumental that echoes the menacing music of Three 6 past, “By Mistake” (Remix) is a master-class in flexing, as Dolph racks up a massive tab at Barney’s, Juicy J brags about dining with the Mayor in his signature staccato flow, and Project Pat bursts with drawly aggression. “By Mistake” was one of the highlights from Role Model, Dolph’s most recent project. Peaking at #15 on the Billboard 200, Role Model provides a new context for Dolph’s braggadocio and sets an example for rising independent rappers and anyone else trying to get out the mud. Role Model finds Dolph leveling up, experimenting with new flows and raising his boastful bars to a superhuman level. Featuring appearances from Snoop Dogg, Offset, Key Glock, Kash Doll, and Dolph’s mother on the moving intro track “Black Queen,” Role Model is Dolph’s origin story, establishing him as a symbol of hope to kids in the hood who desperately want to improve their lives. Earlier this year, Dolph announced the winner for the #ThatsMajorChallenge, inspired by his video for “Major,” featuring Key Glock, offering the choice between $30k cash or a Dodge Challenger SRT Hellcat to the maker of the best user-generated content for the song. Stay tuned for much more from Young Dolph in 2019. Rising out of Memphis to become one of the South’s pre-eminent rap labels, Paper Route EMPIRE embodies the independent hustle. Home to superstar Young Dolph, heatseeker Key Glock, and Tennessee-born upstarts like Jay Fizzle, PRE partnered with San Francisco-based music company EMPIRE to provide a nationwide platform for local talent. Generating hundreds of millions of streams in 2018 alone with albums such as Young Dolph’s Role Model, which peaked at #15 on the Billboard 200, and Key Glock’s Glock Bond and Glockoma, Paper Route EMPIRE is making a major impact as an indie label, and will only grow stronger in the future.